This article is about the recurring minor character in the WarioWare series. For the minigame from WarioWare, Inc.: Mega Microgame$! and WarioWare Gold, see Pyoro (minigame). 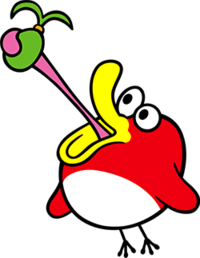 Pyoro is a recurring bird character in the WarioWare series. Pyoro's name and design are a parody of Kyorochan, the mascot of the Japanese chocolate brand Choco-Ball. He has his own games in nearly every WarioWare game, most of which can be unlocked by playing every microgame at least once. He has quite a few abilities, including being able to extend his tongue (similar to Yoshi), seed shooting at fast speeds, and beak stretching. Although Pyoro was originally considered flightless, it is shown in WarioWare: Smooth Moves that he can fly. Initially, Pyoro must dispose of various falling beans by either eating them or shooting seeds at them, but this evolves into fending off evil insects that want to destroy Pyoro's flowers, home, etc. Pyoro's games take advantage of the system on which they are played. For example, Pyoro S on WarioWare: Smooth Moves is used with the Wii Remote, and Pyoro T on WarioWare: Touched! is used with the touch screen. Besides being a game producer, Pyoro is also in charge of the Prize Machine in WarioWare: Twisted!. Pyoro also has his own game for the Nintendo DSi's DSiWare channel, Bird & Beans. Pyoro cameos in the background of the Gamer stage in Super Smash Bros. for Wii U, where there is a chance he appears as part of the stage in his "claymation" form from Game & Wario walking back and forth. He can be used to hide from 5-Volt. Pyoro also appears in Super Smash Bros. Ultimate, as a spirit. Pyoro from WarioWare, Inc.: Mega Microgame$! Pyoro 2 from WarioWare, Inc.: Mega Microgame$! PYORO R from WarioWare: Twisted! Pyoro T from WarioWare: Touched! Bird & Beans (known as simply Pyoro in Europe), a remake of the Pyoro and Pyoro 2 games for DSiWare. A bird, which resembles Pyoro, from the microgame, Jumpin' Rope. The "R" in PYORO R stands for "Rotated", the "T" in Pyoro T for "Touched", and the "S" in Pyoro S for "Sensored". Pyoro's color is primarily red in all WarioWare games, with the exception of Pyoro 2, where he is yellow. There appears to be more than one of Pyoro's species, as a power up in WarioWare: Smooth Moves will add smaller "Pyoros" as backup. In Jumpin' Rope, one of the characters who jumps resembles Pyoro.